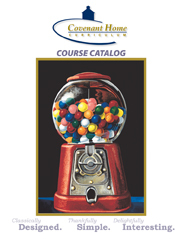 2011 Catalog (current) - It's Free! : Covenant Home Curriculum - Providers of a complete, eclectic, classical approach, Pre-school through 12th grade curriculum for home educators with a reformed Christian world view., The World's Best Reformed, Comprehensive, Classical, Homeschool Curriculum, and School Administration Provider! Thank you for visiting our Web site. We hope it has been a helpful resource to you in evaluating our curriculum. To request a paper catalog, include the words "PAPER CATALOG REQUEST" and your current physical address in the "Special Instructions or Order Comments" portion of the payment information screen during your checkout process. To view or download selected portions, scroll to the bottom of this description. If you would like to download portions of the printed catalog you may do so by clicking on one of the links here.